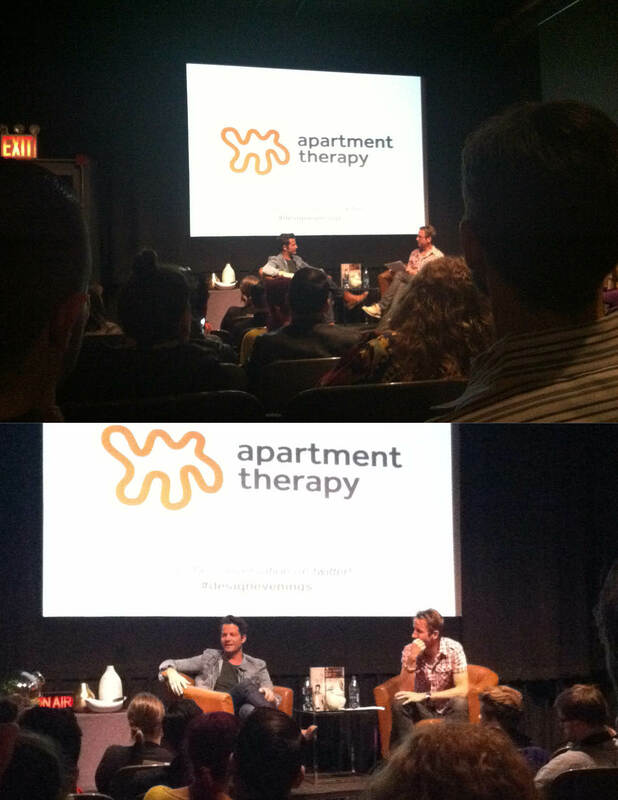 One of Melissa and my regular monthly to do’s is attending Apartment Therapy’s Design Evenings. The guest for April was Nate Berkus. He is incredibly talented, down-to-earth and attractive. His new book, Things That Matter was published last fall and after hearing him talk, I think I will have to pick up a copy. One of the things that he kept coming back to was how you should absolutely love everything in your home. It might start out as only a few things, but hopefully it continues to grow. He said he would site on the floor for however long it took for him to fine the a couch he loved. Hopefully those things help tell the story of your life too. Nate discussed how he realized that the events in his life, like being in Sir Lanka when the tsunami hit in 2005, taking his partner, had influenced the way he designed and the things he filled his home with. He and his boyfriend had just got engaged, I think earlier in the week, (they were so cute together,it just made you like him that much more) and talking about how that relationship has also influenced his design. You should check out Melissa’s great recap and pictures. Anyway, as I said, out of all these things I have collected, there are some things that I really love. And I am slowly collecting things I really love and find beautiful to replace the things I don’t. At the same time, I think knowing that New York was not going to be a permanent home, I may have been more concerned with function instead of beauty and function. Which is really kind of silly. Why shouldn’t it be both. If you’ve see some of my shoes, you know that I sometimes only swing toward beauty, so it really shouldn’t be that hard for me to find things I even just like, instead of, “oh it was just given to me and I need it, so just live with it.’ I mean, you do actually have to live with it every day. So as I start to sort though my list and put things in piles or color coded dots, I am going to be thinking about taking on the the things that I really want and will definitely use or have on display at my new home. The absolutely must take list includes a KitchenAid mixer, library bookshelf, Otto (the Room and Board ottoman I won a few years ago), a huge trunk, an India bell, two bikes, a sewing machine and my handleless mugs. Once I get myself to my new destination, I will try to remind myself to not worry about having the things that fit a function and wait for that chair or desk that is perfect for me and I know that I can’t live with out it. 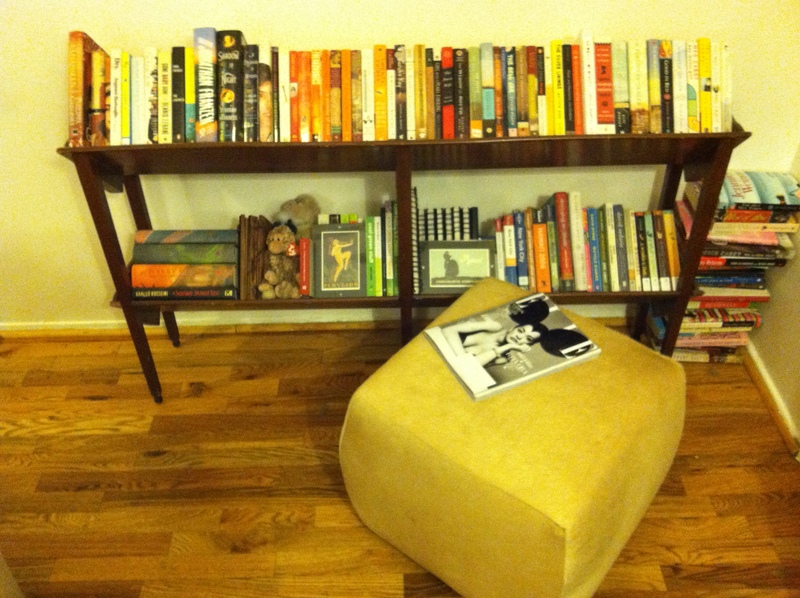 This entry was posted in New York, Perishable Item and tagged Apartment Therapy, Design Evenings, moving, Nate Berkus on April 30, 2013 by perishableitem.